Wake-on-LAN is one of those technologies that I love, and one I think doesn't get enough attention. I guess it's a bit geeky still. The actual technology is a hard to understand if you've never done any networking, but basically it works on layer-2 (MAC addresses) only. It sends the magic packet to everyone (broadcast), but only the intended device says "Oh, that's for me" and turns on the PC it's attached to. I always found it funny that it's called a magic packet. The "magic" part was fitting before I had a better grasp on networking, but, incidentally, now that I do understand networking better, the "packet" part makes less sense (since it uses layer-2 Ethernet frames, not IP packets). You can read up more about the technical side over at Wikipedia. You need to use a wired (Ethernet) connection. There is a Wireless implementation known as WoWLAN, but it doesn't have much market penetration and even more requirements than WoL. To this day I regret the fact that I didn't consider support for WoL when building my current PC. I will never again build a PC that doesn't support Wake-on-LAN. 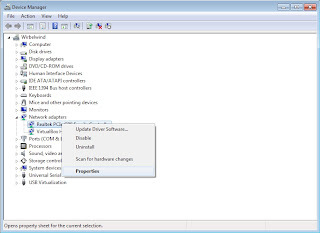 MeetGadget allows you to sort by motherboards with this feature supported. Don't make my mistake in buying a motherboard that doesn't support it if you love WoL, as you will regret it. BIOS implementation varies from one system to another. It's usually under power settings and something along the lines of "LAN wake-up" "Power on LAN" or something along those lines. Sometimes Wake on PCI and the like can be used, but those are usually for if using an separate PCI device (like a PCI NIC) to send a wake-up command. If you don't find one of those options in your BIOS, your BIOS probably doesn't support the feature. It sometimes becomes available in a later version of your BIOS, but not usually. Your NIC either will or will not support it. There's not much you have to do here. Really all you can do is verify it support Wake-on-LAN, which is done most easily by checking the documentation for your NIC. 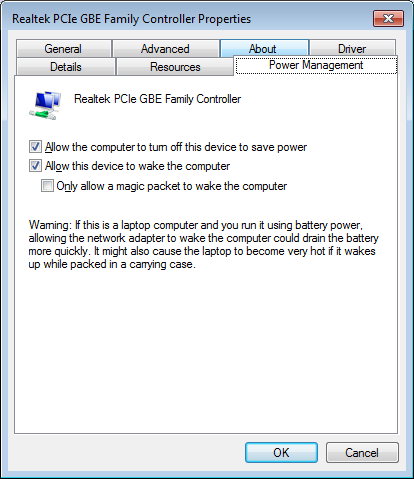 On the Software/OS side, you'll need to tell the device it's ok to respond to Wake-on-LAN (and thereby allow your PC to turn on). I once was beating my head for hours because I thought I had configured this, but hadn't and the PC was refusing to turn on. Click on the advanced tab. 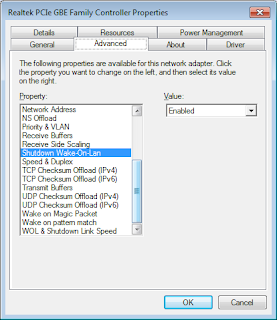 The options may be different depending on your NIC, but for Realtek NICs, the option is usually called "Shutdown Wake-On-Lan". Make sure that is enabled. You should also make sure "Wake on Magic Packet" is enabled. Other names I've seen are "Network Wake-up" "Wake on Magic Packet" and other variations along those lines. 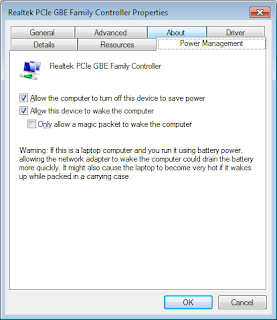 Now head over the the Power Management tab and make sure "Allow this device to wake the computer" is checked. Optionally check the box below it about allowing only magic packets to wake it up (otherwise the device may respond to any ethernet frame directed at it instead of particularly to magic packets). On linux, you'll use a tool called ethtool, here's Debian's official documentation of it. System Preferences -> Energy Savor panel and make sure "Wake for network access” is selected. Now that the system is all set up, you'll probably want to do all sorts of cool stuff with it. While WoL itself is layer-2, most tools that send the packet will operate on Layer-3 and 4 (usually using UDP packets to encapsulate the magic packet). wakeonlan is a command-line Linux tool that I use (it's also available for Mac OS X via Macports). You should be able to pull it from you repos. The majority of wired computers at my work support Wake-on-LAN due to my concentrated efforts in making sure they do. I often do remote work at night on the computers, doing this and that. I just ssh in, turn on all the PCs with wakeonlan, and then control them through various methods, primarily ssh-tunneled RDP (as most are Windows 7/XP Pro computers). I like to imagine the look on someone's face if they were in the office and all of a sudden all the computers around them started powering up. Two Windows tools are MC-WOL, which is a command-line tool. I like to script WoL sends, so command-line tools like this one and wakeonlan for Linux are useful to me. If you want a GUI, though, there is WOL - Magic Packet Sender. iPhones can send Wake-On-LAN via Mocha WOL. Unfortuantely Apple in their infinite "wisdom" doesn't allow for this to be automated on certain external events. Android has two big options PcAutoWaker and Wol Wake on Lan Wan. PcAutoWaker will allow for your phone to automatically send a magic packet on connecting to a wireless network. Imagine this if you would: You just pulled into your drive way, and by the time you get in the house your PC is already fully booted up. Now that is a beautiful thing to me. 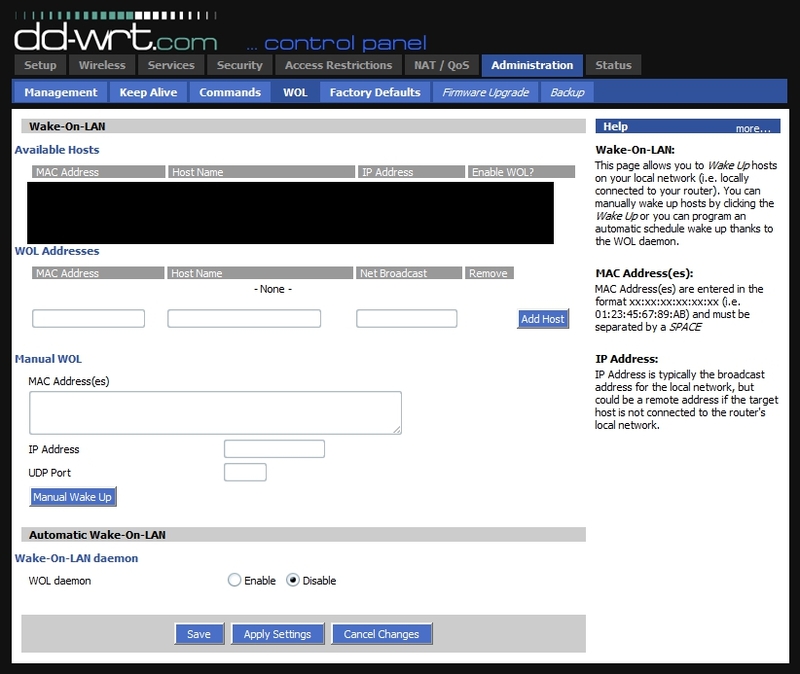 Wol Wake on Lan Wan isn't as cool out of the box, but has some useful features: you can set up widgets for your devices to make sending magic packets easier, and even better: it can be incorporated in Tasker/Locale very easily. This allows for one very interesting thing: Sending WoL packets when your alarm goes off in the morning (note: I don't know if Locale has a similar event trigger). Imagine if you will, your alarm goes off. You're groggy and either hit snooze or turn it off and start getting up. In either case, by the time you reach your PC, it's already booted up. Ah, how wonderful. That's why I love Wake-on-LAN: it allows for two things I love: saving power (leave PCs off and just turn them on remotely when you need them) and automation (I don't turn on my PCs, they're automatically turned on based on my actions). It's a beautiful thing, it's a simple thing, and it makes my life easier and more environmentally friendly. What could you possibly not like?